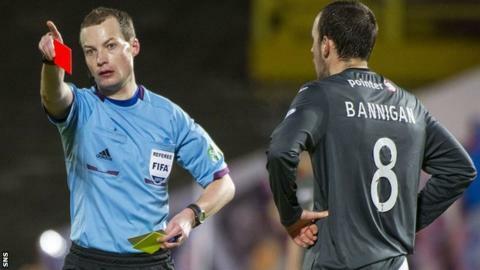 Partick Thistle manager Alan Archibald urged his players to start much better after . Thistle lost an early goal but equalised through Aaron Muirhead's penalty in the second half. However, three more United goals and red cards for Conrad Balatoni and Stuart Bannigan ensured a miserable day for the Jags. "We were very, very poor in the first half. I thought United were the far superior team," said Archibald. "They picked us off on more than one occasion so we were relieved to get in at half-time 1-0 [down]. "I saw our real team for the first 20 minutes of the second half. "It's what we were capable of but we didn't show enough of that in the first half. There's no reason why we're not doing that in the first half. "We started the second half really well and it continued and we got the penalty. It came from good play. I thought we had a foothold in the game. "Probably the turning point was when we had to take Ross Forbes off. He was doing ever so well for us but he had a wee niggle so we had to get him off." Archibald admitted Thistle had struggled to cope with "the movement of the front three" from United and bemoaned the late dismissals. "It's two weeks in a row we've lost players then we've lost two more goals after that, which is disappointing," added the Jags boss.